I was but a fresh-faced lad of three years in the Triangle when it all went down at the Smith Center. 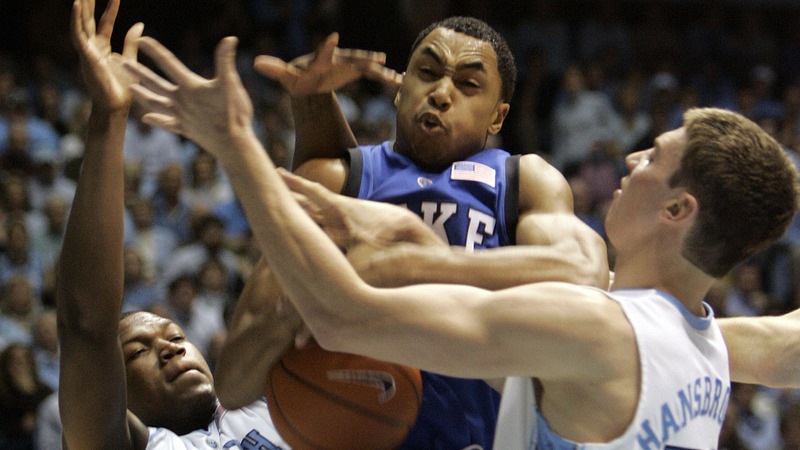 A Tar Heel beatdown of the Blue Devils. A missed free throw and then the elbow to the nose heard round the college basketball world. Blood flowed, teeth gnashed and great generalities about either side's inherent dirtiness and sportsmanship and that famous catch-all, 'classiness' were cemented. Awesome then that 10 years later, both Tyler Hansbrough and Gerald Henderson decided to partner up on a podcasting venture together. "Tobacco Road" will be a weekly discussion of all things Duke-Carolina rivalry related, with guests and inside insights from those who lived the games. That's all well and good, but about The Incident. Episode 1 had to start with some reckoning and a little reconciliation. It turns out that Mike Krzyzewski was resigned to defeat late in that game, but ordered his team not to go out with a whimper. "No layups" was the edict. Greg Paulus proceeded to break that rule by allowing Marcus Ginyard behind him for a coup de grce alley-oop that blasted the roof off. It was an angry Blue Devils huddle after that play. Anger that Paulus had allowed the oop and anger at the loss. Episode 1 had to start with some reckoning and a little reconciliation. You can hear the entirety of Episode One and all the upcoming goodness by subscribing to the "Tobacco Road" podcast on iTunes.